This is a story about Hope. Mayci is my second daughter and Marli is her older sister. We had the hope of completing our family with two beautiful daughters and a life of "normalcy." A life of sisters fighting and picking on each other and sharing each other's clothes. We soon realized that Mayci would not be the typical sister that we had thought we would have. On October 24, 2000 Mayci was born. At two months of age I thought the colic monster had completely taken over her body. We took her to the doctor who said she had something wrong going on. This started our journey of the unknown. It was as if our child had been kidnapped and we didn't know who had her. We had a child who passed every test available but still couldn't hit any milestones. Mayci also had an erratic body movement where she jerked with every heartbeat and her head would turn from side to side. To add to the confusion, at six months of age we found out she had cataracts. We had those removed only to find out she had cortical blindness. This meant that her vision pathway was clear but her mind could not comprehend what she was seeing. At almost two years of age we had traveled to four different states and had seen 45 doctors, each one testing her and referring us to the next doctor. Finally, one doctor said that he thought Mayci had something called a mitochondrial disease. We traveled to Atlanta, GA and did a muscle biopsy that confirmed this terrible disease. A mitochondrial disease is a genetic disease that affects the mitochondria cells of your body. These cells break down food and convert it to the energy your body needs to survive. We were also told that this is a progressive and non-curable disease. Over the next five years we struggled to keep Mayci alive. 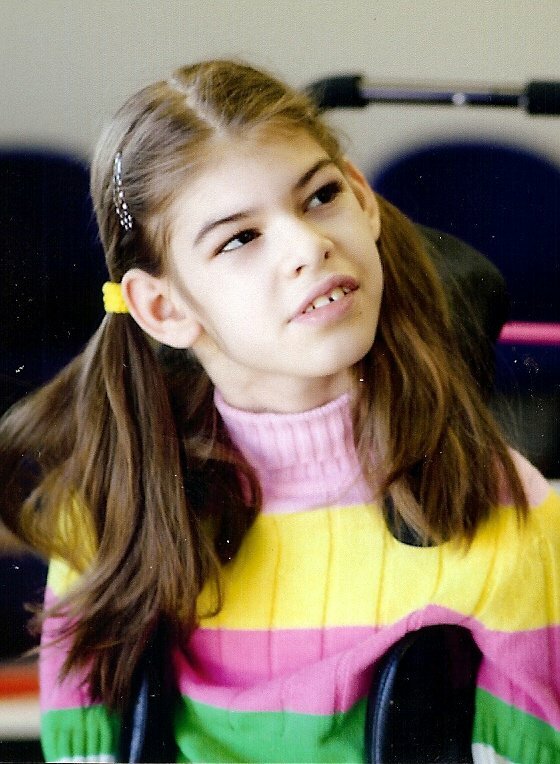 She had a feeding tube put in at the age of four and used a wheelchair to get her around. She did not walk or talk. She had epileptic seizures that progressively got worse every year. By the time Mayci was seven she was considered legally blind, had failure to thrive, was fed thru feeding tube, and had viral infections almost every six weeks. By age eight, Mayci's seizures were so bad that the neurologist was considering putting her in a coma state just to try to give her brain a break. He told us that we were close to the end of our journey with our daughter and to just understand that this was a fight we could not win. In 2008, I heard about Hyperbaric Oxygen Therapy (HBOT). I felt this was our last hope to save her life. We left our home in Tennessee and traveled to Madison, Wisconsin to visit Wisconsin Integrative Hyperbaric Center. We did not know what to expect or what results we would see. To our surprise, on the second day of treatments Mayci's seizures stopped. We thought that this was just a fluke. We stayed for 30 days and every day we expected to see the twitches of the evil seizure. They never came back. Mayci started having an appetite and eating, her vision improved, and her energy picked up. We were all amazed at what we were seeing. HBOT is simply breathing oxygen that is pressurized. While it is an accepted therapy for some conditions such as burns and wound healing, it is considered experimental for many other conditions, including cerebral palsy, seizures, and mitochondrial disease. Studies on its effectiveness have been inconclusive, but case reports of individual children have shown benefits for many children. It is very expensive, but some insurers will cover the therapy for certain diagnoses. It is important to note that rarely children can have seizures in response to oxygen toxicity from HBOT, so please consult with your doctors before beginning treatment, and ensure that the clinic and doctors administering the HBOT are skilled and experienced. This year has been a great year for Mayci. Her neurologist has finally stated that hyperbaric oxygen has helped her with her seizures and her overall heath. Mayci is no longer legally blind. She eats six meals a day by mouth. She has not been hospitalized for any sickness in three years. She is trying to talk and crawl. She still has a long battle to go, but HBOT has gotten the seizures under control so that Mayci can improve. I truly feel that HBOT has saved her life. We still have HOPE.